Tatiana wrote: Is the two hours counting when it happens, or when we find out about it after the half-hour speed of light delay? Last edited by BlitzGirl on Wed Nov 12, 2014 2:33 pm UTC, edited 1 time in total. PolakoVoador wrote: I couldn't understand the image at all. It's moments after the Philae lander separated from Rosetta, about 5 hours ago. 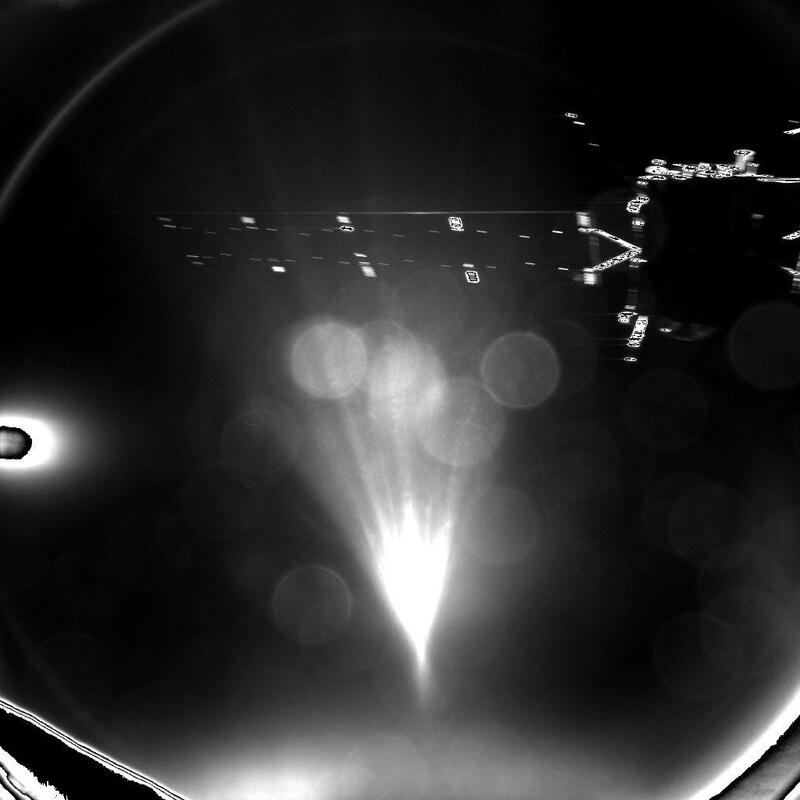 You can see Rosetta's solar panels, a lot of lens flare, and little else. It's like a J.J. Abrams establishing shot. Red countdown. This is getting serious. Between this comic and the ESA live webcast I am getting no work done today. Mission control: stuck on Earth. Indeed. Even worse if you're a chess fan with the world championship going on too. Try not to land on that whale! Last edited by Patteroast on Wed Nov 12, 2014 2:41 pm UTC, edited 1 time in total. Hi manvandmaan the croissant man! I am getting no sleep done today. Done tonight. Do you "do" sleep? I done no sleep because PST. BLUUURGHHH. Ken_g6 wrote: I'm on Firefox on Linux, and I'm getting Cross-Origin Request Blocked errors on the comic. Anyone else? Comic still looks fine for me. I love this Russian guy but I can't understand him very well. 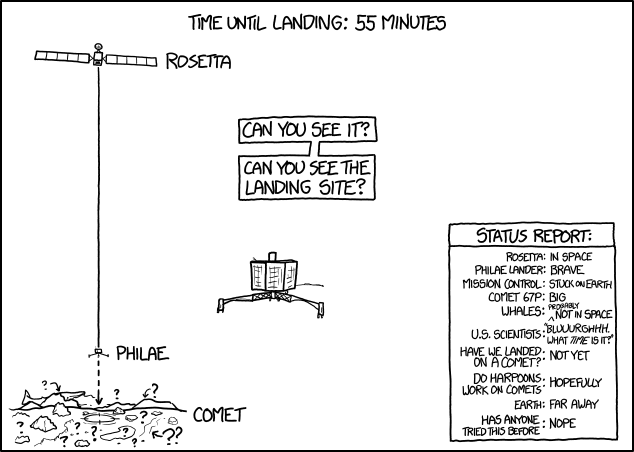 Philae: Are we nearly there? I need the toilet. 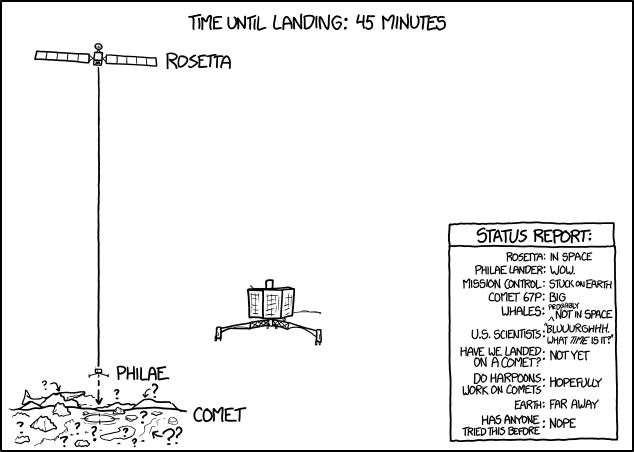 Rosetta: You should have gone before separation. 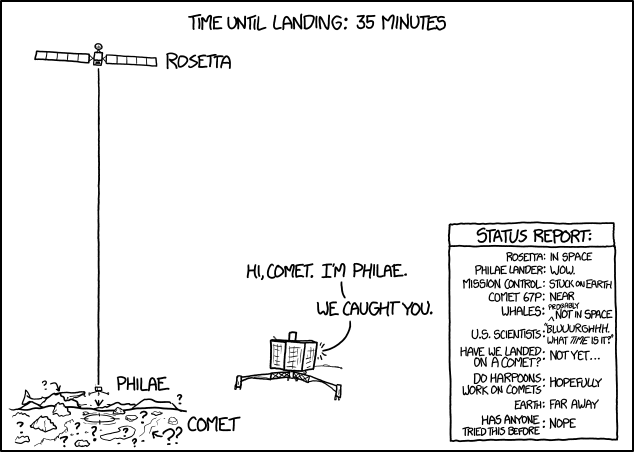 orthogon wrote: Philae: Are we nearly there? I need the toilet. Last edited by HAL9000 on Wed Nov 12, 2014 2:48 pm UTC, edited 1 time in total. I do indeed do sleep, just not generally at 14:45 (I'm on UTC). "WOW. That IS a spacewhale!" Comet 67P is a... Boot! The lander has officially been baobab'd. Hold this or you'll fall! Have you guys seen the pictures Rosetta has been taking of the comet - they're beautiful. 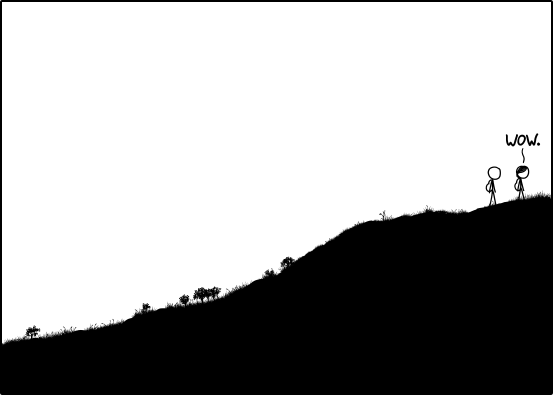 Cool picture of the lander from Rosetta! I am stupid amounts of excited about this mission. 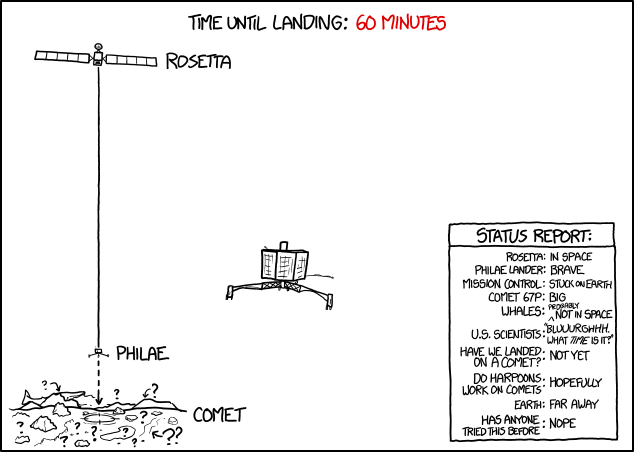 I was already stupid amounts of excited about it before, but now I've got the ESA live stream in one tab to the right and the xkcd comic to the left and I desperately hope I won't need to go to the loo any time in the next two hours. Because I cannot fathom how to pry myself away from this. I'm seeing nothing but the blank image here. Been trying for 20-30 minutes and can't tell what I'm doing wrong. Using Chrome Version 38.0.2125.111 m. The only place I can actually see content from this comic is here in this thread. Also hi, long time lurker first time poster here. Kudos to ucim for the first full-blown manip posted in the thread. I'm super hungry! But if I go eat I might miss something! Maybe I should order Chinese and eat at the computer? Quercus wrote: Have you guys seen the pictures Rosetta has been taking of the comet - they're beautiful. Last edited by Magdiragdag on Wed Nov 12, 2014 3:03 pm UTC, edited 1 time in total. You-Rope... any relation to Europa? I hear that the monoliths gave us every planet (and moon) except Europa. could it be their space agency? Oh no... "EUROPA ATTEMPT NO LANDING"
Last edited by mathmannix on Wed Nov 12, 2014 3:03 pm UTC, edited 1 time in total. Now will the comet speak back in return? I strongly suspect that it only speaks questionmarkish. "???? ?? ???"